We're proud to announce that on January 26, Giganews became the first Usenet provider in the world to reach 2,000 days of high-quality binary retention for more than 110,000 existing newsgroups! The 2,000-day milestone, which is more than 5.5 years of retention, represents more than 25 petabytes of Usenet messages on the Giganews servers. This is a huge feat in the industry and we are proud to be the only Usenet service that delivers the same speed and article completion across the approximately 45 billion articles with 110,000 newsgroups equally. Giganews is 50 percent bigger today than at this point last year and we continue to add servers with this kind of growth in mind. We put together a fun and informative graphical representation of what 2000 days of retention looks like and what we've accomplished over the years. Hundreds of Terabytes of data gets uploaded to Giganews every day, and retention refers to the time that data remains on the Giganews servers and is therefore accessible to our customers. Two thousand days of retention guarantees that you can easily find and access articles that have been posted more than five years ago and text from more than 10 years ago. We are constantly working to make Giganews the world's best Usenet service and just like our retention, we have no plans on stopping. We truly appreciate the great customers who stand behind us. Thanks for your continued support and feedback. If you're not already a Giganews member, we invite you to sign up for a 14-day free trial. Dump Truck is now integrated with Otixo! Otixo provides a cloud aggregation service that lets individuals and businesses work and collaborate across many of their online services from a single application. 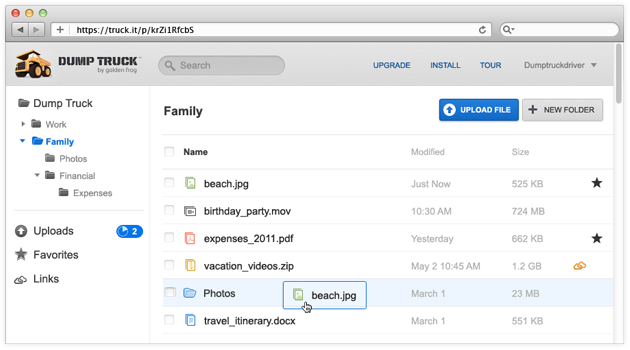 Otixo is a web app that allows you to manage files from multiple online storage accounts in one place. 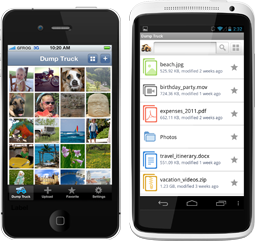 Use it on mobile or desktop devices to search, copy and share files between your Dump Truck account and other online storage services using WebDAV. Track new comments, files and downloads and use email notifications to stay informed in real time! Collaborate with others across multiple online storage services. Spaces creates a neutral place for working on files so you can keep your versions under control. Why use Otixo with Dump Truck? With Otixo and Dump Truck, you can easily backup your data in several locations. Simply drag-and drop files from your Dump Truck account to other online storage services without having to download the files to your computer. Make life easier by collaborating with friends and colleagues across multiple online storage services and managing all your files from one location. At Giganews, we are constantly adding new setup instructions to help you use Dump Truck with your favorite applications. Share your feedback at Golden Frog Ideas and help make Dump Truck even better! To stay up to date on Dump Truck, please subscribe to our blog and follow us on Giganews Facebook, Giganews Twitter, Giganews YouTube Channel, and Giganews Google+. In response to your feedback on Golden Frog Ideas, we worked with Golden Frog to add step-by-step instructions for setting up VyprVPN on any Android device with FEAT VPN! While VyprVPN for Android is preferred for devices running Android 3.1 or greater, FEAT VPN is an OpenVPN option for Android devices running versions 2.1 through 3.2. FEAT VPN is a popular Android app that allows users to utilize OpenVPN without needing to root the device. Rooting an Android device carries a number of security risks, plus it voids the warranty. FEAT VPN is one of the only OpenVPN solutions compatible with any Android device right off the shelf. The latest version of FEAT VPN offers better compatibility for Android devices that are connected to an IPv6 network. Most VPN services only support IPv4 however IPv6 is growing in popularity among app developers. For example, the built-in YouTube app utilizes IPv6. As a result, all of the YouTube traffic will not flow through the users IPv4 tunnel and isn't encrypted or protected. Why Use VyprVPN with FEAT VPN? We wanted to make it easy for Giganews members to combine the flexibility of FEAT VPN with the stability and security of VyprVPN. If any issues arise please take advantage of our 24x7x365 support. We will continue to add setup instructions for useful applications like FEAT VPN so please share your feedback at Golden Frog Ideas and help us help you! In response to your feedback on the Golden Frog Ideas microsite, we worked with Golden Frog to add VyprVPN setup instructions for Synology NAS (Network Attached Storage). If you have a Synology NAS device already, simply connect to VyprVPN using either PPTP and OpenVPN. Using VyprVPN with your Synology NAS device combines the speed and security of VyprVPN with the convenience of Synology NAS. Synology NAS is a storage device engineered for small businesses, however, users with large data storage needs also benefit from it. It provides a centralized location for storage, sharing, and onsite data backup that requires minimal maintenance and offers excellent performance. You can only select a folder on your Synology NAS to sync with Dump Truck online storage - included free with every Giganews account. Why Use VyprVPN with Synology NAS? At Giganews, we believe all VyprVPN users should benefit from powerful storage solutions like Synology NAS without forfeiting their privacy or security. It is critical to secure your connection whenever you access important information online. VyprVPN's 256-bit encryption and secure servers prevent malicious 3rd parties from accessing your data and secures your entire Internet connection from end to end. This provides peace of mind when you use convenient storage solutions like Synology NAS. We will continue to respond to your feedback with more setup instructions and 24x7x365 support. Please continue providing feedback and suggestions at Golden Frog Ideas so we can help you use VyprVPN with your favorite device! Today, we are excited to announce that Golden Frog released VyprVPN for Mac! Giganews members with VyprVPN service can download VyprVPN for Mac starting today. 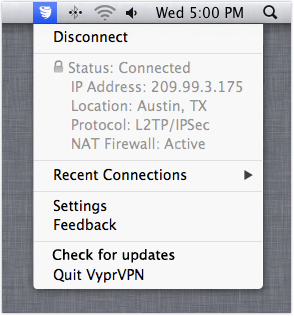 You can use VyprVPN for Mac to manage your VyprVPN connection directly from the menu bar. Skip the manual VPN setup and freely switch between any VyprVPN server location or VPN protocol. It has been a busy couple of months for our friends over at Golden Frog. They also recently released new VyprVPN mobile Apps for iOS and Android so start protecting your mobile device as well as your Mac. If you are not currently a Giganews member and want to try VyprVPN, we invite you to sign up for a 14 day free trial of the Diamond account which includes VyprVPN. Giganews members without VyprVPN, can add VyprVPN to their membership and secure Internet connections on their Mac! Today, Golden Frog posted Part 2 - Dump Truck Web App of their "Welcome to Dump Truck" blog series on their blog. In this blogpost, they cover powerful features of their Dump Truck Web App. If you missed the Part 1 of the "Welcome to Dump Truck series", please read Part 1 - Dump Truck Desktop on the Golden Frog blog.